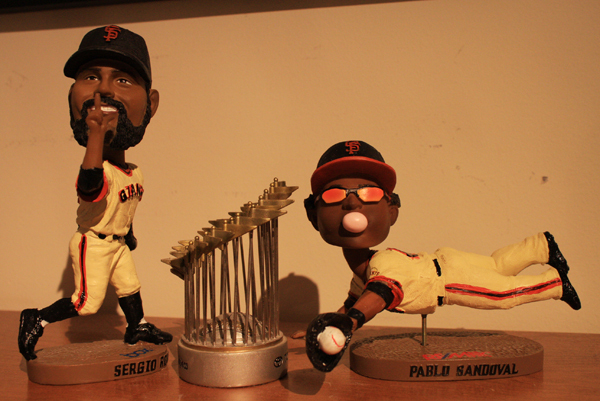 It has been just over a month since the Giants won San Francisco’s first ever World Series. Having lived through 5 Super Bowl victories and an NBA Championship this one seems the most special. Maybe when you take longer to love something it just becomes that more beautiful. 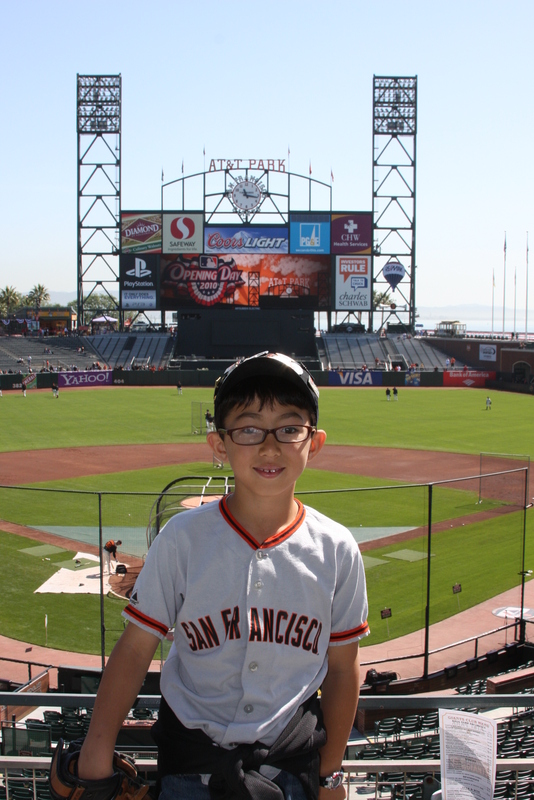 Last week my son and I just sat outside the empty stadium on a sunny Sunny afternoon and stared at the stadium. 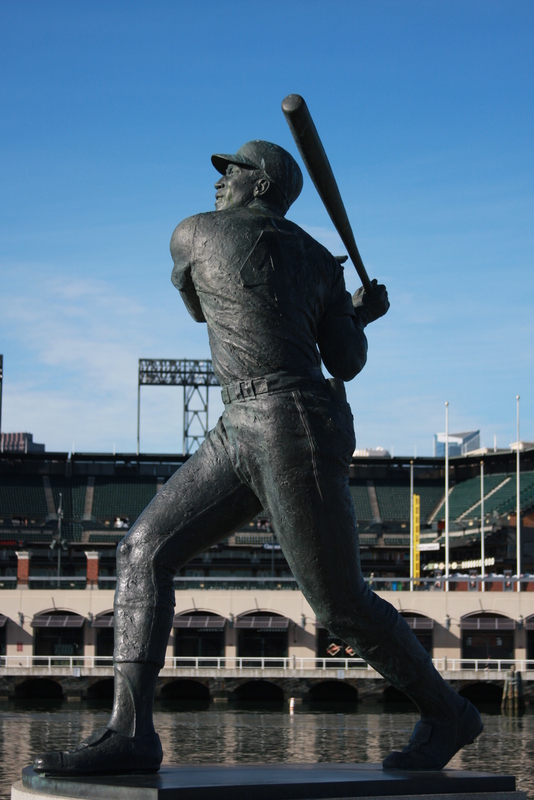 We got a couple of hot dogs and sat on some rocks across from McCovey Cove, reading about all the teams from 1958-2000. There is a plaque for every team that existed before the team moved to AT&T Park (nee Pacific Bell Park). It all seemed so peaceful, but you could almost hear the cheers still echoing across the cove. On this day the park just glowed. We recalled all the great memories we shared . Not just for this year but years gone by as well. Reading about the great teams and players, we never would have imagined on Opening Day 2010 that this team would win it all. Well it really wasn’t the same team that won the World Series. That team in April was the core. It grew into the beautiful story it became in October (and November). Every month was something new. You cringed at the team’s obvious flaws. Like the beautiful girl with the gap-toothed smile and snorting laugh, it had character. You loved her with all those flaws. Some days you saw her potential. Some days she was clutzy and broke your heart when she didn’t look all that special. At the 2010 home opener, the Giants PR Department had the team enter the stadium through the centerfield fence like coming out from the corn in the movie “Field of Dreams”. Although my favorite movie, it was a bit corny to do this for the Giants. Little did we all know. 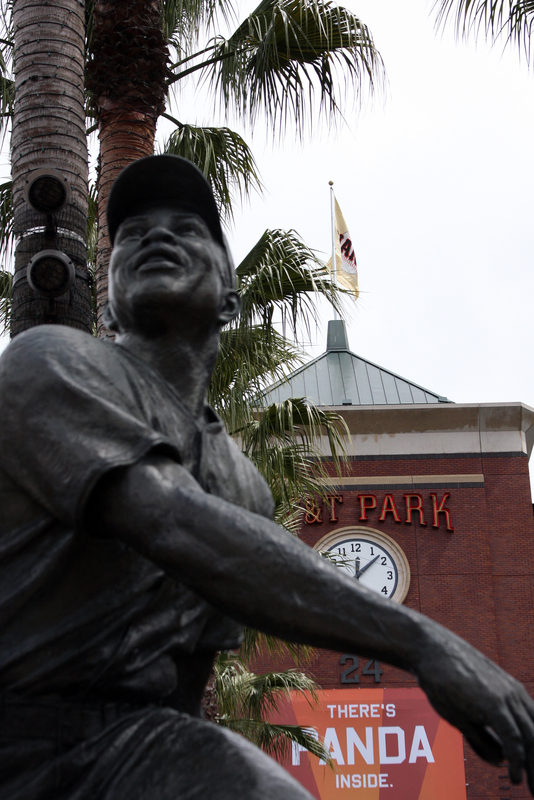 AT&T Park was a special place in 2010. It was a real Field of Dreams. It turned a city into believers. It made them wear fake beards and long haired wigs. It made grown men wear silly looking panda hats on their heads that were so hideous their dogs would want to attack them out of embarrassment. Like the team, AT&T Park has it’s many flaws although it has widely been considered the most beautiful stadium in baseball. To me it just gets better with time. Like Wrigley in Chicago and Fenway in Boston, it is the stories that go with the park that give it it’s beauty marks. 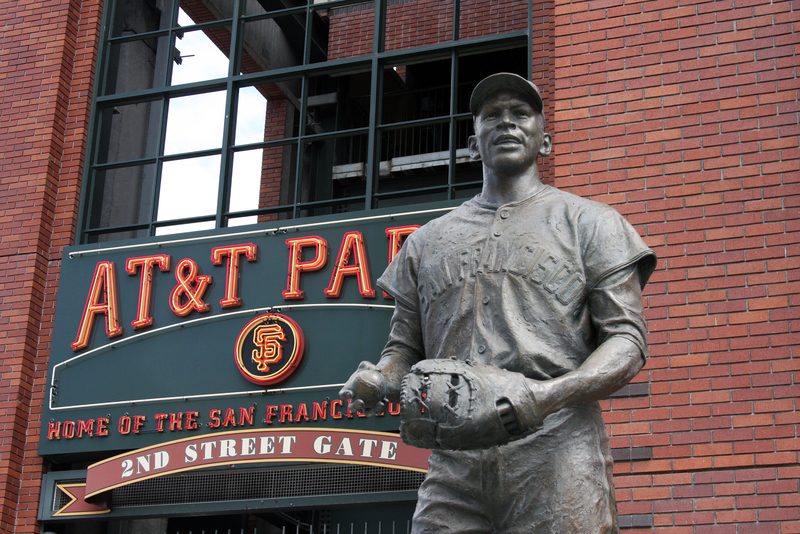 Many say the park was the park that Barry Bonds built just like Yankee stadium was the one that Ruth built. 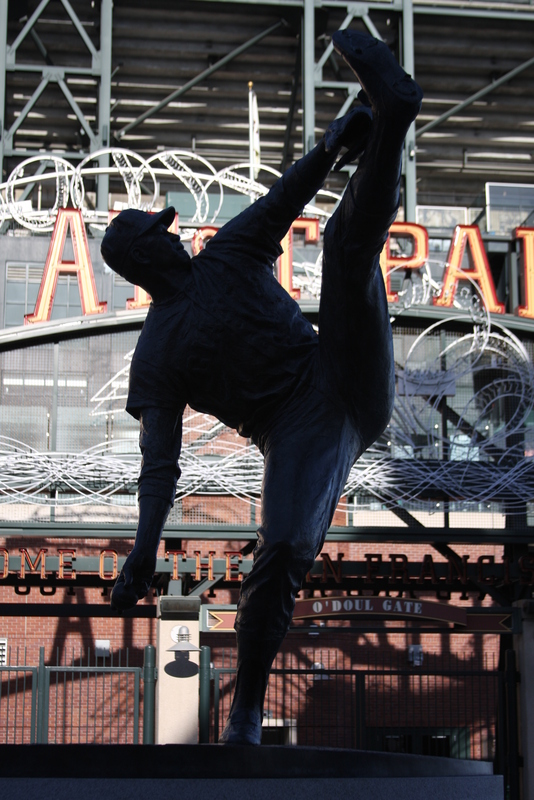 Juan Marichal Statue on 3rd St.
Only 10 years old, AT&T Park does not have the memories of Juan Marichal and his crazy high leg kick or Gaylord Perry’s spitter, but in 2010 the team gave them more than enough memories. Timmy “the Freak” Lincecum with yoga-esque delivery wowed crowds and even gave them a month-long scare when he basically showed he was normal and lost 5 straight games. Overweight fan favorites, Pablo Sandoval and Bengie Molina (Little Money and Big Money) failed to perform to expectations and were subsequently relegated to part-time player and trade bait. Key players, Renteria, Sanchez, DeRosa and Uribe all spent time on the disabled list, reminding us that this was just a fact of life. People get hurt. People miss work….and unfortunately people move on. Uribe and Renteria are already gone with Uribe heading to the rival Dodgers. The city has changed. When you wear your Giants cap these days, people give you a smile or a thumbs up. Permanent smiles are pasted on people’s faces and the sports talk radio shows still are filled more with talk about baseball than football, hockey or basketball. A couple weeks ago I ran into a friend of my dads at the driving range. He was wearing his Giants cap. I hadn’t seen him in a couple years and the conversation revolved around my dad and then moved to baseball. At one point he asked me if I went out and partied or if I sat home and shed a tear when the Giants won. He knew I had shed the tear for my dad. It was my story. Long time fans celebrated peacefully for those who never got to see this day while younger fans partied into the night. For 53 years and 53 teams, baseball broke the hearts of San Franciscans, but tonight an improbable team ended years of frustration and enhanced the love of a sport and 25 guys who worked as one. As their management and the team tried to convey, the victory was for a city, for fans, for past players and for past generations. The atmosphere has been electric for the last month. You could feel how badly people wanted this one and perhaps needed it. Torture was the word of the year to describe this team, but it really wasn’t one year. It was 53 years. A team of underdogs, a team of misfits, a team that nobody ever believed had a chance, was the team that everyone fell in love with. The team with a rich history of Hall of Famers had its most successful season with a bunch of no-names. In the future, many will not remember some of the names that helped to bring San Francisco it’s first baseball championship. As I mentioned previously, the City of San Francisco loves its champions, but more they love their champions who do it the right way. 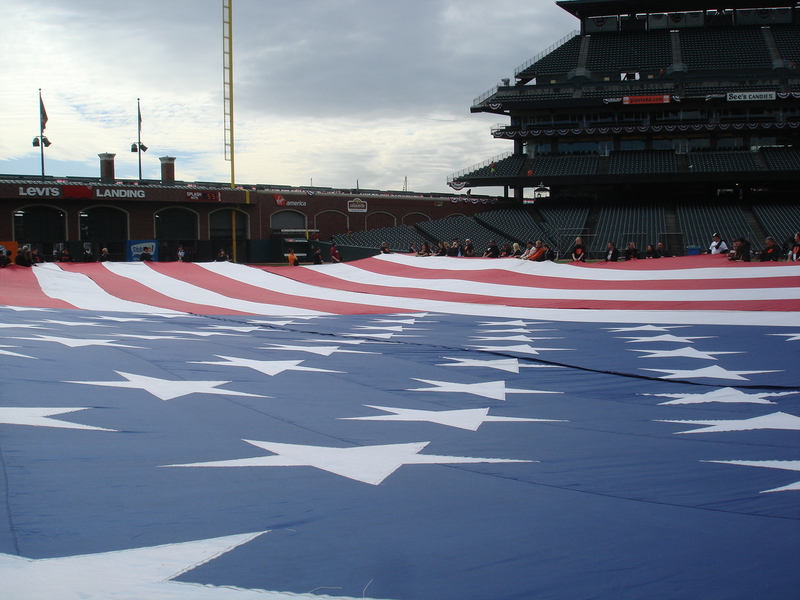 The 2010 San Francisco Giants did it the right way. There will be many who say they knew this team had it from day 1, but if they tell you that, they are liars. A team of misfits, discards from other teams, showed the world what teamwork is all about. They have said repeatedly this post-season that the most talented team doesn’t always win. It’s the team that plays the best that wins. As late as the beginning of August this team was in 4th place and 7 or 8 games out of 1st place, but the team showed how baseball is a parallel to life. You work hard, you keep grinding, and you never stop believing. Nick and I Fear the Beard! As a San Francisco native I am overwhelmed. There are hundreds of thousands and perhaps millions of natives who grew up in the same generation as me, who had moms or dads that introduced them to baseball at Candlestick Park or Seals Stadium and had to wait their whole lives. Everyone has their own unique story. There are many people like me who wish the dad that introduced them to the sport were here to enjoy and celebrate with them. Yes baseball is just a game, but it is America’s past time. It is like life itself. Unlike those in New York who have 27 Championships, this is San Francisco’s first. For those who have waited their whole lives for this day, it is a day to be savored. Hopefully it won’t be 53 years until another championship is won. Those who had seen things go wrong in the past know the heartache and how sweet this victory is. This will not be taken for granted. It will be cherished. It will be savored. The team itself reminded everyone of the history of the organization. It reminded those not old enough about the heartaches of the 3 previous attempts at the World Championship. It reminded me of the great history of San Francisco, and it reminded me of all the great things the City has to offer. The team helped me to teach my son about all the great history and people that built this City. My son saw Joe Montana, Bob Weir, Steve Perry, Danny Glover, and a slew of other celebrities from the area cheering for the team just like him. Somewhere around the 7th inning of Game 2 he started to grasp the gravity of the situation and understood the passion around the desire to win the whole thing. A World Series victory would be the beginning of a big healing process. There is an old adage in baseball that as Spring Training begins, hope always springs eternal. No matter what I am always optimistic about the Giant’s chances. This year I wasn’t. I really felt this team didn’t have what it would take. It shows how life is so unpredictable, how what is perceived could also be deceiving. Baseball and life are unpredictable and just when you least expect it, it will serve you up a surprise. Growing up watching Mays, Marichal, Perry, Cepeda, McCovey, Clark, Mitchell, Speier, Fuentes and all it is amazing this team has accomplished something that those other teams couldn’t. No heroes, just a bunch of blue collar ballplayers. Fortunately for me I was able to share a little bit with my own son and helped him to understand how unique an experience this is and how unique this team is. 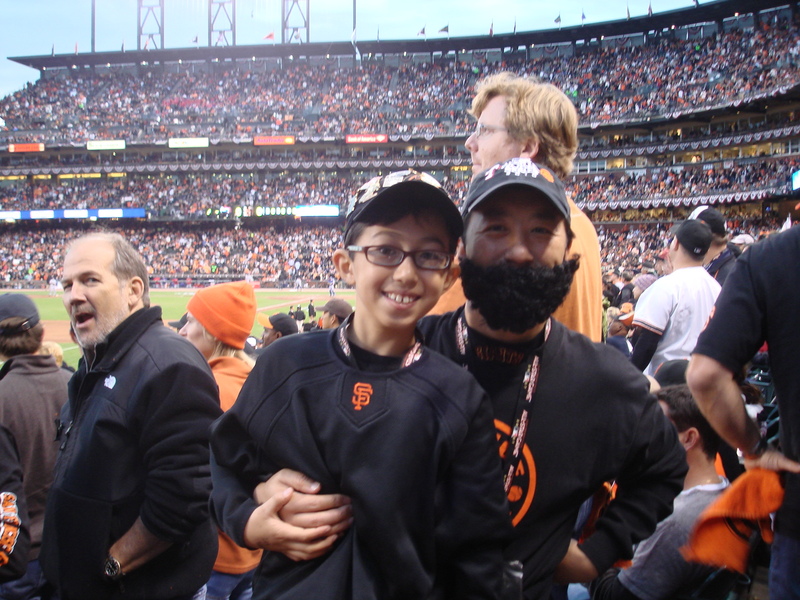 Attending the last game played at home and also participating in the Opening Ceremonies of Game 2 of the World Series was not only a unique experience, but it was the creation of a memory that he will keep forever. Having my son tell me, “I will never ever forget this day” was a highlight for me. I remember when my dad took me to see Ed Halicki’s no-hitter back in the late-70s as if it were yesterday. I know my son will be thinking the same even 30 years from now. It is only fitting that Edgar Renteria, a player that is at the end of his career and contemplating retirement was the MVP of the series. He spent many months on the bench, has a torn muscle in his arm, yet was one of the many heroes in the end. Hard work, determination and a never say die attitude, were Edgar’s message to all. It’s one we should all learn to employ in life. I am speechless to say the least. I am more choked up than anything else. The memory of all those who never got to see this day, but taught us to love this team, this City, and the game of baseball would be proud of the 2010 World Champion San Francisco Giants. They were not only a team of destiny, but true deserving champions in every sense of the word. A team of misfits who fit perfectly together. As I write this, there is honking and hollering in the streets. The younger generations are celebrating in the bars and dancing in the streets, but I know there are many like me also sitting at home with not so dry eyes thinking of those who never got to see this but helped us to appreciate this moment. They taught us how to “love the laundry” (as Seinfeld calls it). Such a bittersweet time in San Francisco. The much maligned announcer, Joe Buck, said it best….”America’s Most Beautiful City now owns Baseball’s Sweetest Accomplishment”. Is There Magic Inside? Or are there Particles? Game 1 and 2 are over. The Giants were victorious in a game 1 that was labeled a pitcher’s duel and turned out to be a slugfest. A crazy day as I got stuck in a meeting as the first pitch was tossed. Others in the meeting had one eye on their iPhones and the other on the presentation. Coughing and mumbling occurred when the Giants went down 2-0 but smiles broke out as the game was tied at 2-2. it wasn’t a pretty victory, but at this time of year you take wins any way they will come. Game 2 was more traditional..at least from the Giants way of thinking. Something else went wrong for the Rangers. “There’s __________ inside” is the tagline of the Giants marketing department. Nicknames and other terms were inserted. Magic, Freak, Panda, Orange and other fun terms were used over and over again. Recently the word Torture was added to reflect the closeness of the Giant’s style of victory, as in “There’s Torture Inside”. As a long suffering Giants fan, I know those Cubs and Indians fans must be rooting for the Giants. There are those who might say that given the Rangers are in their first World Series ever while the Giants are in their 4th since they moved to San Francisco, the Rangers should be an underdog too. Well the experts were all picking the Rangers. 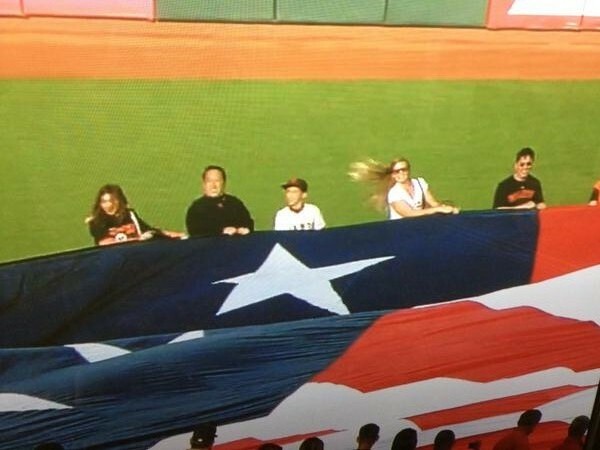 This made the Giants the clear underdog. Not so fast! Don’t those people know about Particles and Magic? They are better than stats and scouting reports. Now that Game 2 is over and the Giants have darkened the hopes of Rangers fans, there is an optimism that this team just might erase the ghosts of 1962, 1989 and 2002. Two of those series, ended on fateful mistakes and great plays while the other (1989) was marred by an Act of Mother nature which made baseball seem very small in the greater scheme of things. One of the morning talk show hosts on the Giants flagship radio station calls it “particles”. The force by which all things come together and create destiny. Was it particles that interfered and suddenly gave the Braves a case of the dropsies? Was it particles that put a hole in the bat of Phillies slugger Ryan Howard when he had a chance to do something big? Was it particles in Game 2 of the World Series that caused the Rangers pitchers to lose the strike zone and allow 8 straight batters to reach base? I’m not sure, but the catch phrases are everywhere. From “Believe” (mantra sung to Don’t Stop Believin by ex-Journey lead singer Steve Perry who is a season ticket holder and attends games waving his towel) to “Torture” to “Magic” the team has captured the imagination of the City. 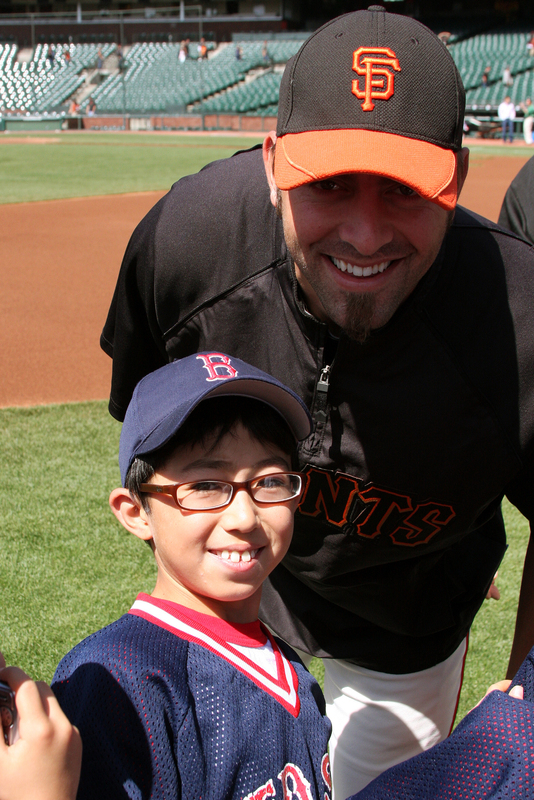 As a long time Giants fan who has been through all the ups and downs, seeing the baseball team I grew up watching on the brink of it’s first World Championship is a bit of an end game. And this time it feels right. I normally never count my chickens before they are hatched, but the particles just seem aligned now that I see it coming. San Francisco has won championships in basketball and football in my lifetime and if you look back at the first championships of those teams it makes perfect sense why this baseball team should be the first. San Francisco has always been the City that does it with style, with a bit of a twist, and in a new way with a dash of the old. It’s businesses such as the Gap, Levi’s, Williams-Sonoma, Zynga, Twitter, etc. are model examples and their Championship teams are no different. The 1974-75 Golden State Warriors won with the first black coach (Al Attles) who had a fading superstar (Rick Barry) that he taught to be a team player and a cast of young players (Keith Wilkes), local heroes (Phil Smith) and other outcasts both young and old. Attles was the first coach to use all the players on his bench such that I can still name them all by heart 35 years later. The team was a heavy underdog to the team many thought to be the next big powerhouse in the NBA, the Washington Bullets, a team led by Wes Unseld, Elvin Hayes, and Phil Chenier. The Warriors used team chemistry, smarts and a great defense to win that series 4-0 for their first and only championship. The 1981 49er Championship team was made up of a young scatter-gunned armed QB named Joe Montana and 3 rookie DBs (including Ronnie Lott) coached by a man they call the Genius, Bill Walsh. Walsh would show the NFL the power of the short passing game. Very few can even tell you the names of the starting RBs for the 49ers that year (Lenvil Elliot and Earl Cooper). Walsh changed the way football would be played for the next 15 years. The 49ers beat their long time roadblock, Dallas, in the NFC Championship game with a famous play known only as “The Catch”. In the Super Bowl, the 49ers were again the underdog to another team making its mark, the Cincinnati Bengals. In fact, it has often been said the jeweler had to change the etching in the MVP trophy to remove Ken Anderson (QB of the Bengals) from the trophy and put on Joe Montana’s name. The 49ers went on to win the first of 5 Super Bowls with a 20-16 win. Oh yes, particles or magic. Was it particles or magic that Joe Montana introduced the Giants starting lineup on National TV before Game 2? Was it particles or Magic that has all that crazy electronic trance music stopped between innings and put the 45,000 people into a happy calmness by singing Lights by Journey with Steve Perry conducting from his seat? Was it particles or magic that MLB told the Giants to leave RF Jose Guillen off the post-season roster because he is being investigated for drug -trafficking, forcing the Giants to use Cody Ross (the eventual NLCS MVP)? Maybe its the particles from the aroma (which was definitely present at a baseball game that made it smell like a rock concert) brought on by the old hippies attending the game: Neil Young (CSNY), Jonathan Cain (Journey), David Crosby (CSNY), Lars Ullrich (Metallica), or Bob Weir (Grateful Dead) that prevented Ian Kinsler’s 5th inning hit from going over the fence. I’m not sure what it is, but I am living in the moment thinking it is destiny. It just feels right. 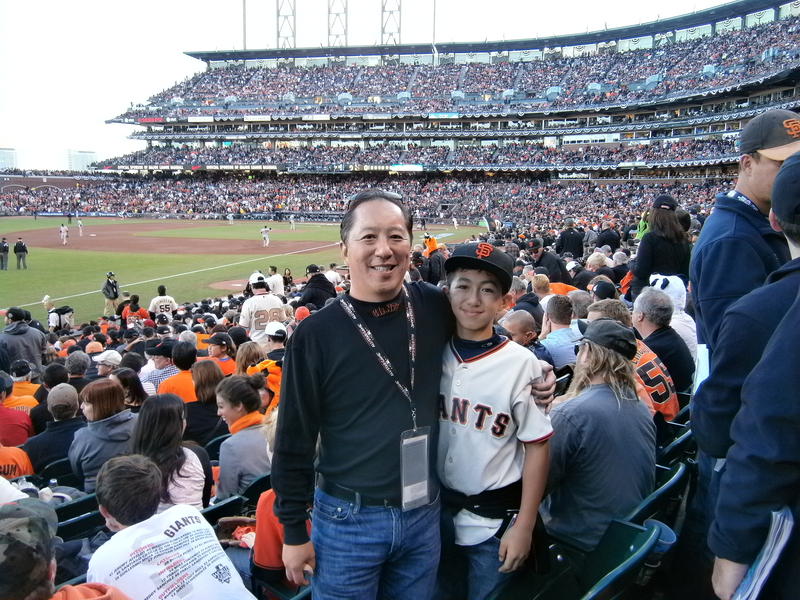 As I sat there singing “Take Me Out to the Ballgame” with my arm around my son right before the Giants would start their big rally in the 7th inning of Game 2, I remembered the NBA Basketball Championship I shared with my father, the Super Bowls with my dad, and the World Series championship we never got to have. I’ll share it with my son instead and it will be just as sweet. I know I’m not the only dad in San Francisco who feels this way. Many of my friends, knowing how big of a San Francisco Giants baseball fan I am have asked me what is going on with the Giants? They hadn’t focused on this baseball team that today is waiting on the eve of the franchise’s first trip to the World Series since 2002. It is only the team’s 4th trip to the Fall Classic since they moved to the West Coast. They have yet to win their first World Series in San Francisco. Ironically they are playing a team that is making it’s first trip ever to the World Series and facored to beat the Giants. So who are these guys? They really are the “Team of Misfit Boys”. Everyone loves an underdog and there is nothing more lovable and underdog than this team. They’ve taken San Francisco by storm because there is something for everyone. People relate to this team on all levels. 75% of the starting lineup was not on the Opening day lineup. These guys might wake up tomorrow and realize that they are in over their heads, but maybe it isn’t coincidence that their owner bears a striking resemblance to the crazy inventor from Back to the Future. I guarantee you though. The Flux Capacitor has nothing to do with this team’s success. the dominating closer who took all the lessons watching his dad battle cancer over 5 years as a teenager and harnessed it into the most interesting character in baseball that is so full of life and has everyone in San Francisco sporting fake beard. You can’t blame this city over its excitement over this team. They represent the common man and act like us. You’ll find them at night shopping at the local Safeway, getting coffee and donuts at the local donut shop before a game, or even eating dinner in some of the nice restaurants in the hotter spots in town. October baseball is rare and the city is hungry for it. Affectionately, Giants baseball is called torture (coined by Giants announcer Duane Kuiper) for the style of close games the team plays. Giants fans live and die by the team’s success and failures. So if you haven’t picked a side, vote for the underdog. Vote for the little guy. Vote for the crazy misfits who nobody believes will win (24 out of 30 ESPN experts are picking the Rangers). Vote for the Beard, the Panda, Smiles, the Water Buffalo, Bweez and the Freak. They’re playing for all of us underdogs.